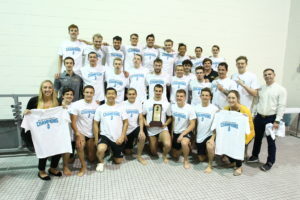 The men's swimming and diving team pose with their NJAC Champions t-shirts after sweeping the conference 4-0 for the third consecutive year. Photo courtesy of Rowan Athletics. A sixth New Jersey Athletic Conference (NJAC) Rookie of the Week award for Kevin Yanagisawa might not come to a surprise to some. But what came to a surprise for Yanagisawa himself, were the t-shirts that came with it. 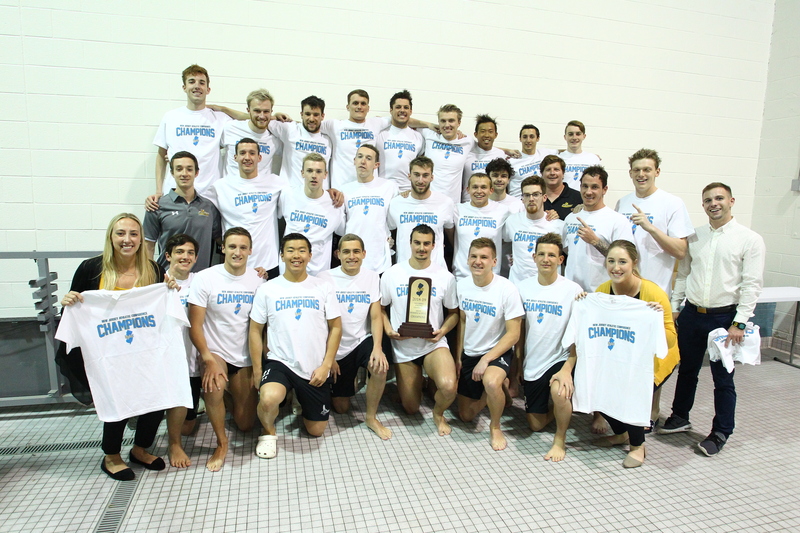 The Rowan men’s swimming and diving team had just won their third consecutive NJAC title, sweeping the conference yet again. And there the rookie was, unaware of his team’s accomplishment until his championship t-shirt was handed to him. Talk about being a Rowan swimming and diving program rookie. With their sustained dominance within the NJAC, Rowan has drawn high-profile comparisons. When asked if his team winning the NJAC has become akin to the New England Patriots dominance within the AFC East (they have won it for a decade straight), head coach Brad Bowser acknowledged the obvious hyperbole but did not deny the notion. Even with a team that may not have looked the way some expected it to at the beginning of the season, Bowser says his expectations are always for the team to compete at their highest level and wants them to do anything in their power to make the team better. And, armed with a slew of underclassmen talent that includes Yanagisawa, it’s no wonder the team has preformed the way it has. The freshman took first in the 500 freestyle, second in both the 200 butterfly and 1000 freestyle. His time of 9:54.70 in the 1000 free marked a career best. The 1000 freestyle came down to the wire and was decided by less than a second. The 200 butterfly was another nail-biter that was decided by less than half of a second. Yanagisawa also split a 50.30 second 100 yards in the 400 freestyle relay. The team-first mindset isn’t limited to just Kevin either. Senior captains Dave Smits and Dan Lawton keep the team running like a family and come with high praise from others. Bowser commented on how he has embraced his team in a way that is bigger than sports. When asked what he has learned from this team, Bowser has learned to be patient, letting the younger swimmers come into their own. He has also learned this year that he has to enjoy the time he has with the team saying, in his four years coaching the players, he’s not preparing them for the next level of their swimming careers. Instead, Bowser’s molding them into being young adults. The Profs travel to Kings Point, New York on Saturday for a meet against the Unites States Merchant Marine Academy, but their eyes are set ahead to the AFC Championship Game. They’ll be in Piscataway, New Jersey on Feb. 22 for the Metropolitan Conference Championship, which they’ve also won the last three years. The goal of being the best public school in the nation is within reach for both sets of Prof swimmers, men and women, according to Bowser. Regarding what it’ll take to make that a reality, Yanagisawa comes with one thing in mind.